I haven't posted here in ages. Real life has eaten me. I'm now both Director of the Ancient Mediterranean Studies Program as well as the Graduate Program Chair at UNO, plus had various family concerns. The podcast is one of the more careful, in terms of historiography. 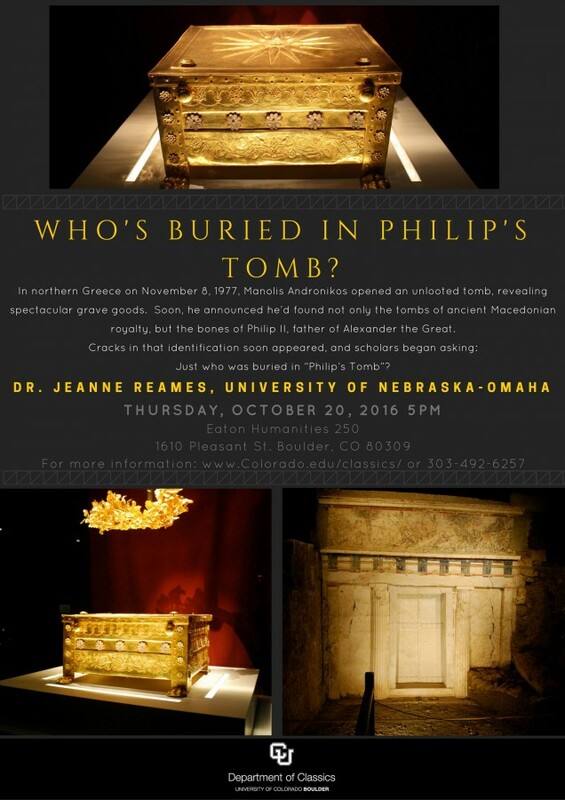 Second, if anyone lives in the Boulder/Denver area, I'll be giving a public talk, "Who's Buried in 'Philip's Tomb'?" at the University of Colorado, Boulder, on October 20th (2016). It's free and open to the public. As some of you ma know, the 40th anniversary of the opening of the tomb is coming up in 2017. There have been some new contributions to discussions of the bones, two articles published in 2016 (Bartsiokas, et al., and Antikas/Antikas-Wynn). They'll be included in my presentation. "One institution of the old Macedonian kingdom, kept up the Ptolemies in Egypt, as in other Hellenistic courts of those days, must have given social prestige to a certain number of families - the practice of bringing up a picked number of boys at court in attendance on sovereign and in close association with the boys of the royal family. They were called paides basilikoi, and in after-life a man who, as a member of this corps, had been the comrade in boyhood of the man now on the throne, might describe himself as the king's syntrophos. An analogous number of girls seem to have been brought up with the little princesses of the royal house. Possible the title of tropheus ("nurturer") of the king, which we find borne by certain men at the prolemaic court (as at other Hellenistic courts), means that the person in question had had charge of this corps of boys, together with the direction of the little prince, who was now king." If anyone is interested, I've started a small community for Greek and Roman art, particularly sculpture - the sort of things that Alexander would have been familiar with. It's called greek_art if you'd like to take a look. Mary Renault says something similar in The Nature of Alexander - "that so little is adduced against him is remarkable." Perhaps she had read this. This is a little video on Alexander's statue by John Romer from his 1994 television series The Seven Wonders of the Ancient World. He goes on to say that Alexander's face was used on the Colossus of Rhodes. He also reckons that Alexander was a bit deaf! This map of Alexandria comes from E M Forster's Guide to Alexandria (1922). The island of Pharos was, according to Forster, empty in the early days of Alexandria (possibly until the building of the lighthouse about 279 BC) except for a temple to Hephaestion. Presumably this temple is the one Cleomenes, the Greek Alexander left in charge of Egypt, built in the hope that Alexander would excuse his corruption charges. He was executed by Ptolemy in about 322 BC. It is possible that the temple to Hephaestion might have been the first building that anyone saw on sailing into the new Alexandria. The prehistoric harbour (the island was known to Homer), might still have been in use until the causeway was built, creating the two great harbours, and merchants arriving in the new city might have drawn up their contracts and sworn to uphold them in Hephaestion's temple, as Alexander ordered that merchants' contract were to include Hephaestion's name, and oaths were sworn in Hephaestion's name. Is this a testimony to Hephaestion's organisational abilities, and perhaps a reputation for fair dealing? niangao: Must-see Alexander artifacts in/around Athens? I'll be traveling to Athens for the first time next month, and I know that I'll just be overwhelmed by all the amazing places and things there is to see. Are there any particular Alexander or Hephaestion artifacts (or sights), big or small, in or around Athens that I should be on the lookout for? I would hate to miss something must-see. Thanks! I don’t know if anyone will be interested but I’ve written a very long, and doubtless boring, essay on Alexander & Hephaestion’s early years. Just to let you know that my new book on The Death of Alexander the Great is now becoming available through online bookshops. In addition to the reconstructed text, the book includes a series of separate articles discussing these events and their reconstruction in the Cleitarchan version. For example, this is the first publication of my new theories on details of the construction and iconography of Hephaistion’s pyre. Now that the reconstruction of the last four books of Cleitarchus' History Concerning Alexander are completed, I am working backwards into the earlier books. I plan that the next (third) volume will contain the three books of Cleitarchus dealing with Alexander’s activities in Afghanistan.